SAVEUR is a magazine for people who experience the world food first. Created to satisfy the hunger for genuine information about food in all its contexts, the magazine emphasizes heritage and tradition, home cooking and real food, evoking flavors from around the world (including forgotten pockets of culinary excellence in the United States). It celebrates the cultures and environments in which dishes are created and the people who create them. It serves up rich, satisfying stories that are complex, defining and memorable. SAVEUR is the definitive culinary and culinary-travel magazine of its generation. The magazine I am most excited to receive each year is Washingtonian magazine’s January issue, which always includes their list of the year’s 100 very best restaurants in the D.C. Metro region. I felt similarly holding my first issue of GFF magazine. Like many of us in the gluten-free world, we followed closely the Kickstarter campaign for a magazine that promised to be like no other gluten-free publication. Once they hit their funding goal, we collectively waited for the day the first issue would be on newsstands (or arrive in our mailboxes). The inaugural issue delivered what was promised. I loved seeing the woman who transformed cooking and baking in my kitchen several years ago being celebrated for her contribution to the gluten-free community on the cover (Lena Kwak). The quality of the paper stock for the cover and interior pages was impressive for a first-time publication. The creative, striking cover photo of Lena Kwak promised gorgeous photography. This all hinted towards the great things I would find inside the magazine. 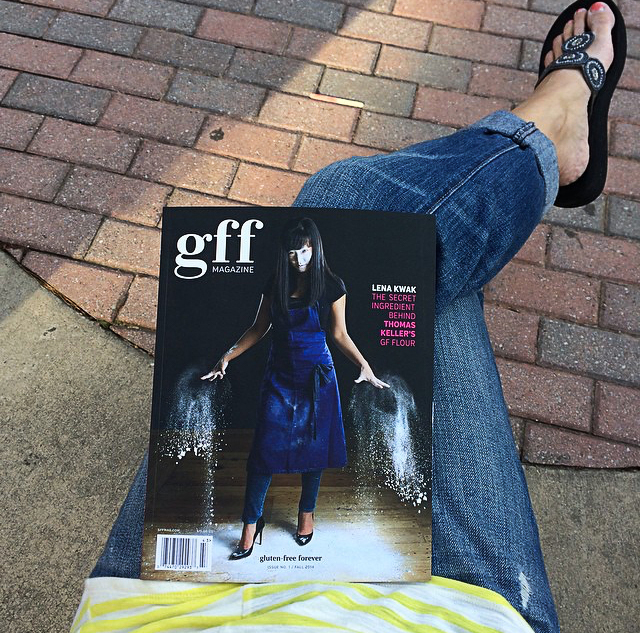 The content in the first GFF magazine delivered. The featured city is San Francisco from an insider’s view of what to do, where to sleep, and, of course, where to eat. The photography throughout the issue is some of the best food photography you will see. As for the recipes, there aren’t many I don’t want to make. Top Shelf Butterscotch Pudding, Broccoli Rabe with Toasted Garlic and Calabrian Chiles, Cheddar-Parmesan Cauliflower, Pan-Seared Halibut with Brown Butter and Hazelnuts, and every Niki Ford pasta recipe in the magazine gives you a small sampling of what I plan to cook in the coming weeks. There are excellent articles and features as well. I discovered must-try crackers in the gluten-free cracker review. I enjoyed the article on various cheese plate combinations for a perfect get-together. There are also great articles on a gluten-free baker (gluten-free sourdough bread! ), the cover story on Cup4Cup flour (Lena Kwak’s creation), and many more. As for the in-depth travel article on San Francisco and Napa, it has sparked in me a need to return as soon as possible, GFF magazine in hand as my tour guide. If you can’t find the magazine on newsstands where you live, order it. You won’t be sorry. Now that I have finished reading GFF magazine’s first quarterly publication, I must wait a few months for the next issue. I plan to celebrate in early 2015 when I have GFF magazine’s second issue in one hand and a glass of wine in another as I savor each photo, article, and recipe.